The Racha or Raya islands are located about 25 km south of Phuket and know as an excellent diving and snorkeling daytrip destinations. However, there are some differences between them. Racha Yai is quickly developing into a place to stay on for few days with some bungalow and resort operations springing up in recent years, it is a relative small island 24 km southeast of Chalong pier on the east coast of Phuket that has always been famous for its crystal clear sea, white powder sand, snorkeling, diving and big fishing. 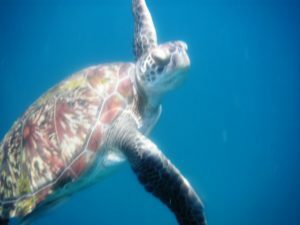 Racha Yai offers some of the best dive sites in the region to explore throughout the year, and generally has the best visibility year around of the daytrip destinations from Phuket. At the northern tip of the island, two pretty little bays are known for their deep, clear waters and colorful corals, they have a gently sloping sandy which also provides a good opportunity for snorkeling and diving. But the best area is considered to be on the east coast where the currents allow a gentle drift dive along a rocky slope covered with an incredible display of corals, which, in addition to the wealth of water, nutrient attracts large schools of tropical fish. Batok Bay is clear and perfect for snorkeling, though the bay gets quite busy with visiting boats in the afternoons. The island’s pristine beaches continue underwater as a white, sandy seabed, interspersed with hard-coral gardens and boulders. With your first experience into the clear turquoise water you’ll know you made a good choice coming here for your scuba diving. One of the best places of Racha Yai is also, Siam bay, a large bay without boat and few people which is a pretty place to isolate and enjoy the surrounding beauty of the island. Around 8 years ago a new dive site was made in this bay featuring life size concrete elephants, a temple, giant clam and other structures, this was created as an artificial reef to attract more marine life. Besides, this place is a great place for experienced divers; it will be a good location to make a first open-water course training scuba diving. There are four points to practice diving in Racha Yai depends to season. Generally it’s sandy, gently and visibility is good in this area. You can found so many fishes, ad example schools of barracuda. Racha Noi or Raja Noi is the more isolated of the two islands, its located 5 Km south of Racha Yai Island and about 15 km south of Phuket. But it is also a popular dive site for experienced divers. Indeed, the depth is greater and the currents generally stronger than its sister to the North Island. Racha Noi is uninhabited and has no services or accommodation, but there’s some great diving in the area. The visibility is one of the best of the scuba dive sites day trip from Phuket due to a extra depths and proximity with the lands. Like Racha Yai there are two bays with a sandy bottom but with few people and you can make your first open water scuba diving in this area. You will encounter huge rocks that cause the presence of Manta rays and whale sharks. The South tip of the island offers the opportunity for a dive on a large pinnacle which rises up to 12 m where you can found larger fish like Manta ray and sharks. Currents here can be quite strong, but you are rewarded by so many fishes like schools of blackfin barracuda, octopus, sea snakes and blue-spotted stingrays. Furthermore, you may be seen turtles too at Marita’s Rock which is formed by huge granite boulders. 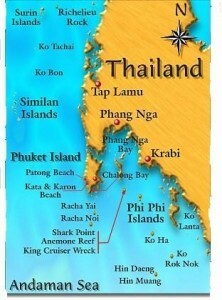 Racha Noi offers many wonderful opportunities for deep dives. This entry was posted on Saturday, August 17th, 2013 at 4:33 pm	and is filed under Dives. You can follow any responses to this entry through the RSS 2.0 feed. Both comments and pings are currently closed.